Crispy on the outside and juicy on the inside! 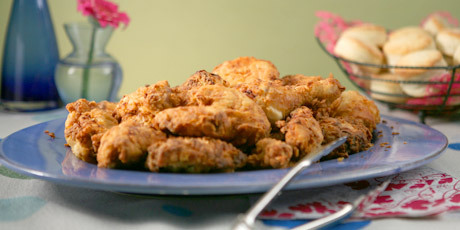 This buttermilk fried chicken is a perennial favourite! 1. For marinade, whisk buttermilk, mustard, salt and peppers. Pour over cut-up chicken, cover and refrigerate for at least 6 hours and up to a day, stirring occasionally. 1. For frying, whisk flour with baking powder, salt and pepper in a large flat dish. Lift chicken pieces out of marinade and, without shaking off excess liquid, coat with flour. Let chicken sit in flour, turning occasionally, while heating oil. 2. Pour oil into a large, heavy-bottomed pot or pan, so that oil only comes halfway up the pot. Heat oil over medium-high heat until it reaches 350 F (180 C) (a fryer thermometer is a great tool here). Add 4 pieces of chicken to the pot and reduce heat to medium-low. Fry chicken for 5 minutes, adjusting the heat so it hovers between 280 F (145 C) and 300 F (150 C) (oil should be constantly bubbling) then turn over. Fry 7 minutes more then turn chicken again, frying about another 3 minutes. Transfer chicken to a paper towel-lined baking sheet to drain (and check for doneness by opening chicken or using a probe thermometer to read 175 F). 3. Return oil heat to 350? F (180 C) and repeat process with remaining chicken. Cooked chicken can be transferred to an unlined baking sheet and kept warm in a 250 F (120 C) oven. Serve warm or chill overnight and serve on a picnic!